Rebel's Yell: Are the media in Mississippi sitting out another civil rights battle? Are the media in Mississippi sitting out another civil rights battle? As I paid for my newly-printed super-duper press kit announcing the release of my latest book, I knew I was wasting my money - and I was not wrong. The press release was intended for publications and media outlets in the state of Mississippi where I live. I hoped to announce to my fellow citizens the release of SHAKING THE SUGAR TREE, a romantic-comedy novel about a gay single father whose deaf son helps him find a boyfriend. Here's how it works: When a company or an individual wants or needs press attention, one writes a press release and attaches appropriate documents - an author's photo, a photo of the book cover, graphics, whatnot. As a former newspaper editor, I am quite familiar with the flow of press releases that come over the transom. Editors must pick and choose, of course, because there's simply not enough room to print all of them. Some press releases are more newsworthy than others. Some have clearly been put together by deranged lunatics. Others announce new services in the community of interest to readers, company expansions, new restaurants, art shows, the latest releases at the cinema. I knew, going in, that the competition was fierce, but I had to ask myself: How many Mississippi authors have released a novel lately? Doesn't Mississippi pride itself on its authors? And wouldn't newspapers in my own backyard -- even the one in my home town -- want to share my happy news with their readers about a local who did good and got a book published? A month has gone by, and thus far, the answer seems to be ... "apparently not." Does it have anything to do with the main character being gay? Is the great state of Mississippi not ready to cope with the fact that gay people exist? Do these media outlets believe that ignoring the lives, struggles and achievements of gay people will make the whole "gay thing" go away? I spent a year editing a small newspaper in Mississippi. I know the answers to my questions. Most newspapers and media outlets here are so dependent on advertisers to survive they are reluctant to run stories that might offend people, that might challenge the status quo, that might raise uncomfortable questions or issues. They are extremely cautious and not a little timid. Perhaps their survival depends on it. I understand that. What bothers me is the perception created among readers when the news media shies away from controversy. If we don't talk about gay people, it's easy to pretend they don't exist, or they're not important, or that they have nothing to say. If we don't talk about gay people, how are we going to deal with bigotry and prejudice and move Mississippi into the 21st century? More generally, if newspapers are not allowed to talk about the realities on the ground, how can their readers consider themselves informed? What's the point of buying a newspaper if all it does is confirm the status quo and refuses to educate readers about the issues of the day? Are Mississippi media consumers content to be spoon-fed this daily diet of the status quo, or do they, perhaps, want something more? Not all media outlets are so timid, of course. Mississippi Public Broadcasting (MPB) is a good source for news, and I'm quite fond of the Jackson Free Press and blogs like Deep South Progressive. We need more media outlets like these. A lot more. I mailed out twenty press packets to media outlets near and far. I also emailed some personal contacts in the media business -- people I've met, people I've worked with, people I've encountered on Facebook. Thus far, I have heard back from two people. One fellow somewhat sheepishly told me that the owner of his publication was a fundamentalist Christian who wouldn't touch my press release with a 200-foot ice pick. The other agreed to have a look at a review copy of my book, which I supplied at my own expense. If this person liked the book, I might hope for a review or perhaps a small mention. And what of the folks at the newspaper where I worked for a year? They didn't respond at all. Is my book, perhaps, so awful, so poorly written, so utterly lacking in any literary merit whatsoever that no decent person would dare mention it in polite company? Apparently not. Not if the folks leaving reviews on Amazon.com and Goodreads.com are anything to go by. The vast majority of my reviews have been a solid five stars. "Nothing I can say will ever come close to adequately describing the brilliant awesomeness that is this book. I feel like I hit the reader’s jackpot and am a better person, a better reader, and a better reviewer for having the privilege of experiencing the life that is Wiley Cantrell, and by extension, Jackson Ledbetter and their son, Noah. It’s not very often a book gets a strangle hold on me but this one grabbed me from the get-go, and wow, what a strong grip that wouldn’t let go." "I LOVE Nick Wilgus’s touching, hilarious, heart-breaking, over-the-top but totally believable gem of a novel. These characters, and the perfectly lyrical language they speak, won’t quit you just because you finish the book. They’ll move into your heart and take up residence." "Recommend it completely and it is solidly in my all time favorites list. Wiley, Noah and all their people are unforgettable." 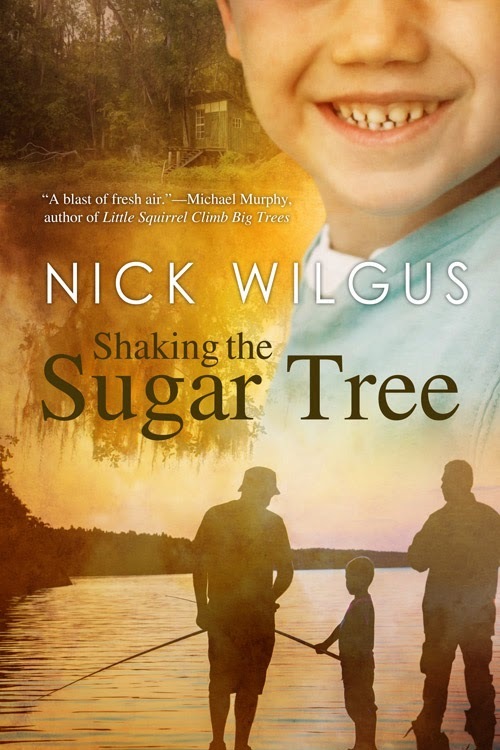 Since the media in Mississippi are holding their tongues, allow me to use this blog post to announce the release of my new novel, SHAKING THE SUGAR TREE, published by DreamSpinner Press. SHAKING THE SUGAR TREE is available in both print and ebook formats. Just because my book features a gay character doesn't make it a bad book. SHAKING THE SUGAR TREE is all about family, love, needing someone, meeting someone, struggling to survive, raising a special-needs child. It's funny. It's heart-breaking. It's universal. I don't fool myself into thinking that the publication of one book in the state of Mississippi is an earth-shaking event that demands the attention of the media. It's not. Many books have been published over the years, and have no doubt received the same indifference. My point is this: Mississippi has a choice. If it wants to know about gay people, it can do what it has always done and tune into Bryan Fischer and the American Family Association and be told how horrible and disgusting we are. Or -- here's a thought -- it could let its gay residents speak for themselves. It could pay attention to filmmaker Diana Salameh, who is working on a documentary about gay people in Mississippi called A RAINBOW OVER MISSISSIPPI. It could write about Papa Peachez, a gay rapper and musician in Jackson who recently released an album called ALLONE. It could spare a few column inches now and again for Mississippi writers like Kevin Sessums, who wrote MISSISSIPPI SISSY. And, on the rare chance that a Mississippi writer bases a novel in Tupelo and writes about being a gay parent, it might consider setting aside one of the paragraphs in the news briefs column for a small bit of recognition. It might even want to do a book review. After all, we're here and we're Mississippians, and our lives, struggles and accomplishments are just as important as our neighbors. And we're perfectly capable of speaking for ourselves. To its shame, Mississippi sat on the back bench during the Civil Rights struggle in the 1960s. Will it do so again as another battle rages?